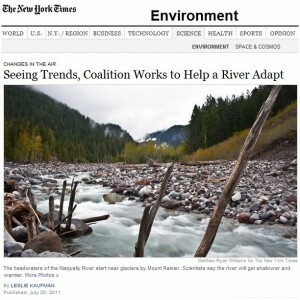 NY Times reporter Leslie Kaufman is working on a series explaining how communities are adapting to issues associated with climate change, and she wanted to do something on a significant watershed. She eventually found her way to the Nisqually, and this is her story. Rain Dog Designs, along with others from the Nisqually Watershed, accompanied her along some of the way during her visit to Eatonville. 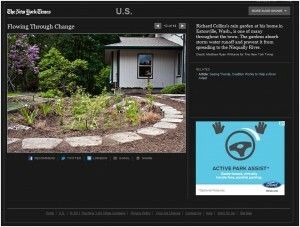 We designed and constructed the rain gardens for Richard Collins that are featured in the accompanying slide show, in addition to the many others we have completed throughout the Town. A recent and important development – Eatonville has the most per capita rain gardens of any jurisdiction in the State, 1 for every 120 people, and growing.